Amusement park and roller coaster historians such as William Mangels, Robert Cartmell, and others have regaled LaMarcus Thompson as the father of the roller coaster. While there is no doubt that he built the first switchback railway in 1884 at Coney Island, the world's most famous beach resort, it doesn't mean he invented the roller coaster, just that he was the best at promoting and improving it. Numerous books have been written about the resort, especially its seedy side, but recent historians neglected all but its most promoted attractions, and were reluctant to challenge previous researcher's conclusions. For example, it was gospel that Captain Paul Boyton's Sea Lion Park in 1895 at Coney Island was the first enclosed amusement park in the country, but Boyton had built an earlier Chutes Park in Chicago the previous year. And the claim that Thompson built the first switchback railway, well that is another story that we will explore in detail. In researching a book about Coney Island's rides and attractions, I read many newspapers and magazines such as the Brooklyn Eagle, the New York Times, Billboard, Leslie's, Harper's Weekly, among others. My goal was to discover as many rides and shows at the resort as possible, and describe them in detail. However, it wasn't helpful when the Brooklyn Eagle reporter wrote in the 1880's and 1890's that "Coney Island was crowded last weekend and that the scenic railways and carousels were busy," without describing them or their locations. Of course there were occasional clues during lawsuits or accidents, This led to exhaustive patent research using the U.S. Patent Gazette index, Norman Anderson's amusement park patent list, and later the discovery of Victor Canfield's amusement park patent Web site which he linked to the U.S. Patent Office's Web site. I looked for inventors that lived in the New York City area on the hunch that many of their patented rides might have been built at Coney Island. I found many matches, and using the patents, I could finally describe them in my unpublished book "Historic Coney Island." While there are a number of early roller coaster patents, both switchback and circular, between 1872 and 1886, the mystery is if any were actually built by their inventors and where. The first of the patents U.S. # 128,674 for an Improvement of Inclined Railways, was awarded to John G. Taylor of Baltimore in 1872. It was definitely a primitive out and back coaster with two parallel tracks where a car with flanged wheels descended via gravity induced momentum along an undulating track to the far end where passengers unloaded. The car, which had two longitudinal benches facing each other across the center, was then pushed up a short incline, and transferred via a short length of track beneath the car that slid horizontally when pushed to line up with the return downhill track less than 10 feet away. Since the patent didn't describe the car's braking system nor passenger platforms for loading and unloading, the drawing was thought to just match the required patent model. Little is known about this obscure inventor, who shortly after the Civil War moved from New York state where he was born in 1829, to Toledo, Ohio. He was a dirt poor carpenter, but a born tinkerer, who after watching children slide down hills on their slide boards, was inspired to design a railroad whose cars could travel both up and down hills. He envisioned a ride that would thrill its passengers with speed, rather than take them for a slow scenic ride. His innovation was to bend the rails into a circle, allow the passenger car to roll down the incline from a height, and use the ride's final uphill incline as a brake on the car's momentum, thus eliminating the need for friction brakes to bring it to a final stop. By logically tying the two ends of his tracks together into a continuous elliptical loop, he returned passengers to their starting point without the inconvenience of awaiting a return train or the interruption of a mildly exciting ride. Wood's invention was noticed and imitated by several other Toledo inventor / businessmen. Philo M Stevens traveled to Chicago to build a circular railway with a slightly modified design. The Chicago Daily Tribune reported on September 30, 1883 that his 22-foot-high, 140-foot-diameter circular railway was under construction at a cost of $800 on a large vacant lot at the corner of State and 22nd Street. The reporter misspelled his name as Philo M. Stevenson, and gave his home town as Toledo. The design, according to the patent he applied for on October 16, 1883, was nearly identical to Wood's, but had a constant slope down, and a constant slope up. The car, which stopped at the end of the uphill grade, was held in place by an anti-rollback pawl. The two-car trains could accommodate 6-9 passengers seated sideways in each car, and Stevens offered three short 15-18 second rides for a nickel. The newspaper article claimed that Stevens had already built two coasters in Toledo, and would built one shortly in New Orleans. 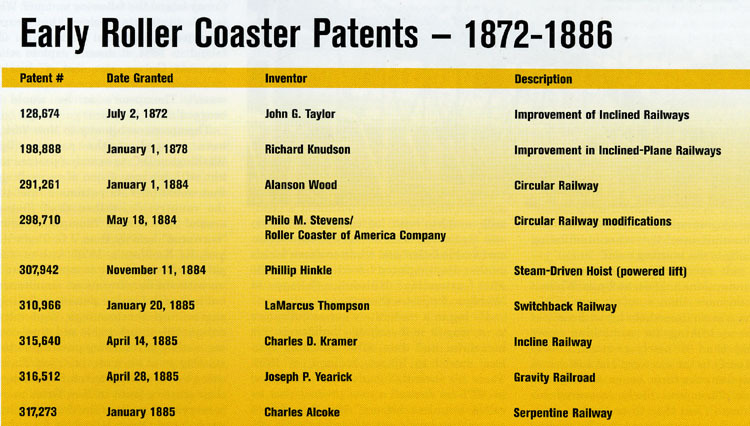 His patent #298,710 Roller Coasting Device was granted on May 18, 1884, and assigned to the Roller Coaster of America Company; thus where the generic name roller coaster originated. Toledo inventor Joseph P. Yearick patented a parallel-track linear coaster because he was concerned that the circular railways took up to much space and needed large lots. Besides they weren't likely to derail due to the centrifugal force that circular railways produced. Since he claimed in his patent application that all previous roller coasters were circular and his patent was filed on June 6, 1884, it is unlikely that he saw LaMarcus Thompson's switchback railway , which opened at Coney Island a week earlier. Yearick's design, which had its loading station in the middle rather than at one end, and had two parallel tracks that merged into two short single tracks at each end, was suitable for narrow lots Passengers boarded the cars at the highest elevation on track A, then coasted downhill towards the front of the lot, then upward until its momentum was exhausted. It then reversed direction and was switched onto track B, where it coasted downhill to ground level, then uphill to arrest its momentum. The cars were then raised by windless back to the starting level. He was awarded patent US #316,512 for his Gravity Railroad on April 28, 1885. The various newspaper articles from 1884-1885 indicate that the roller coaster fad was wide spread. In the middle of the country where it started, there were circular coasters in Indianapolis, and Evanston, and Lafayette, Indiana; Cleveland, Cincinnati Cuyahoga Falls, Chippeau Lake, and Canton (Myers Lake), Ohio; Milwaukee, Eau Claire, and Silurian Springs, Wisconsin, Davenport, Iowa, Houston and Galveston Texas; and Kansas City, Missouri. In the west there were coasters in San Francisco, Stockton, Santa Cruz and Los Angeles, California, and in Denver, Colorado. And in the east there were coasters at Philadelphia's Fairmont Park, and Conneaut Lake, Pennsylvania, Baltimore, Maryland, Camden, New Jersey, Toronto and Windsor, and London Ontario [Canada], Chautauqua, and Bronx, New York, Nantasket Beach, Salem and Revere Beach, Massachusetts. There were likely many more, but newspapers in cities like Pittsburgh and St. Louis haven't been digitized. Roller coasters in several cities weren't successful either because the public didn't patronize them, or the builder failed to pay for his bills for lumber and other materials. Those were often sold at Sheriff's sales to the highest bidder. Several were moved to alternate locations to increase business. Home owners of other communities who lived nearby in otherwise quiet neighborhoods, complained of noise and often successfully campaigned to have them removed as a nuisance. This occurred in Cincinnati, Ohio, Salem, Massachusetts, and Denver, Colorado. Usually relocating them from quiet neighborhoods to commercial districts sufficed. Coney Island, New York, America's largest and most popular amusement resort, attracted inventors with the latest mechanical rides and shows during the 1880's. Owning a carousel at the resort was lucrative. Andrew Culver was relieved when Wood and Cahoon arrived in late June to build their circular railway on property west of the new Iron Pier leased from the Prospect Park and Coney Island railroad. They weren't the only new arrival at the resort with plans. C.A. Smith and his associates David Emmerick and Samuel Fiske, also from Toledo, Ohio, had arrived weeks earlier and built a similar ride on the Vanderveer property. LaMarcus Thompson choose a narrow lot on W. 10th Street to build his switchback railway. While it looked like Thompson would have had a monopoly on scenic railways that summer, there were intially two rival competitors for the tourist's nickels. La Marcus Adna Thompson arrived at Coney Island in May 1884 and began building his pioneer Switchback Railroad at a cost of $1600 on a leased lot at W. 10th Street and Surf Avenue. The local businessmen thought he was crazy. They were certain it wouldn't work and that people wouldn't risk their lives on it. The ride consisted of a pair of metal undulating tracks 450 feet long laid upon a timber frame. A train started at its highest point and ran downgrade at about six miles per hour over a series of gentle bumps until it lost momentum at the seaward end. Eight to ten passengers, depending on size and girth, who were seated sideways, got out and climbed a second staircase while attendants pushed the train over a switch, then to a somewhat higher point on the second track. The passengers reboarded the train and rode downhill over the other undulating track back to the starting point. Thompson's ride opened on June 15, 1884, two weeks after several other roller coasters debuted at the resort. While LaMarcus claimed that he opened on a Sunday at 2 P.M., after his death in 1919, his company celebrated the anniversary on June 14th. While it was little more than a scenic tour of the beach, it was an immediate hit with visitors who were looking for something more thrilling than a merry-go-round. Lines formed early in the morning, and sometimes the wait was over three hours. At five cents per ride, Thompson likely recovered his investment in less than three weeks. Although it was reported that he grossed $600 / day, it would take 12,000 patrons / day at 5 cents per ride. Assuming 30 people were on a train, it would require 400 trips / day, or 40 trips / hour during a ten hour day; one trip every 90 seconds. Since the trains were switched by hand, and the trains were pushed up a hill before passengers reboarded for the return trip, it is unlikely that trains ran any faster than every ten minutes. Thompson couldn't gross $600 / day even with two trains. Thompson boasted to eager Brooklyn and Manhattan newspaper reporters that he conceived his ride while watching happy riders screaming in delight on his friend's circular ride in Louisiana. He envisioned a ride where, instead of being confined to a small circle where its passengers went round and round, they would sit on benches that traveled on undulating rails for a scenic tour of the beach or countryside. He actually built his prototype switchback railroad at the resort according to a 1919 obituary in the New York Sun, but took Andrew Culver's advice and choose the most popular beach in the East Coast, Coney Island to build a better ride. The newspaper publicity promoted his ride beyond his wildest expectations. Entrepreneurs from all over the world recognized its money-making potential, and began inquiring about purchasing one for their park or resort. The Humphrey Company, owners of the Euclid Beach resort near Cleveland, Ohio became the first to purchase his ride. La Marcus Adna Thompson, the eighth of ten children, was born on March 8, 1848, near the small town of Jersey, Ohio. A few years later his family moved further west and settled in Hillsdale County in Michigan. His passion in his spare time on the farm was inventing, building, and operating mechanical toys, such as carts, crossbows, wagons, and an ingenious miniature saw-mill complete with log carriers and buzz-saw. By the age of twelve he had invented an ox-cart for his father and a butter churn for his mother. He completed his schooling in 1866 after attending Hillsdale College in Michigan for just a short time. Frank Darling,, president of the L.A. Thompson Company in 1919 explained in a Billboard Magazine tribute, how LaMarcus Thompson was inspired to invent his first switchback railway. While returning home via New Orleans, he encountered one of his Michigan childhood friends who was operating a crude hand-made amusement ride on a Louisiana beach. It was a circular contraption using a 70-foot-diameter wheel set on its vertical axis but tilted so that it rose twenty feet on its high side. Patrons, paying a nickel, took seats on two park benches located opposite each other along the rim, then the balanced load was slowly spun about its axis with just a little force by the operator. But it was the primitive circular railway operating nearby that intrigued Thompson the most. As an inventor, he saw the potential and dreamed of ways to improve the ride. Andrew Culver, who owned the Prospect Park & Coney Island Railroad that ran from Brooklyn to a terminal on Surf Avenue near the Iron Tower on Coney Island, took a vacation to New Orleans during September and October 1883. The newspaper reported on his return that he saw a "scenic railway" and invited the inventor to move his ride to Coney Island the following summer. While it is a tantalizing clue that explains Thompson's eventual arrival at Coney Island in 1884, it doesn't explain whether the ride Culver saw was a circular or switchback railroad, nor who owned it. It wasn't Thompson's or he would have bragged about it. Thompson, on his way to New York, may have stopped at the patent office in Washington D.C. to examine patents to help him with his new vision of an exciting ride that would offer its patrons a brief tour of the countryside, rather than just going around in a circle. Thompson's new ride "borrowed" heavily from J.G. Taylor's 1872, and R. Knudsen's 1878 incline railway patents. Granted two inventors often came up with similar inventions simultaneously, but both of the earlier patents definitely had engineering shortcomings; especially its antiquated impractical and time-consuming method of returning passengers to their starting point via a second track. Thompson saw a better method to return passengers to their starting point in New Orleans, yet for some reason, perhaps the unavailability of a wider lot at Coney Island, or fear of a lawsuit, he chose not to. Andrew Culver was relived when Joseph A. Cahoon finally arrived in late May to build his circular railway on his property by the Iron Pier. He wasn't the only new arrival at the resort with plans, for C.A. Smith and his associates, also from Toledo, Ohio, had arrived a week earlier and were building a similar ride on the Vanderveer property. While it had looked like LaMarcus Thompson would have had a monopoly on scenic railways that summer, there were two rival competitors for the tourists' nickels. While a ride on a circular railway lasting less than twenty seconds was quite tame by modern standards, it was thrilling none-the-less to 19th century riders. A columnist for Leslie's Illustrated Weekly wrote that the momentum gained by the loaded car in its first headlong plunge carried it completely around through a series of lesser descents followed by gentle billowy risings. It offers "all the sensations of being carried away by a cyclone without attendant sacrifice of life or limb." The first second which elapses after the start gives the novice time to think that he has made a fatal mistake in trusting his vertebra to such a machine. The next, goes off his hat! The ladies scream and the novice shuts his eyes to await a terrific crash, which seems inevitable, for the car is shooting and zigzagging through space like a misdirected rocket. Suddenly its mountings and divings lose their frantic energy, and before the bewildered passenger, can catch his breath the round trip has ended." No one complained that they didn't receive enough excitement for their nickel. The resort's ride owners and others quickly realized that both Thompson's scenic railway the Alason Wood designed circular railways were the resort's big money makers. Like with the proliferation of inexpensive carousels several years earlier, imitators built similar primitive low-cost scenic railways in only a few weeks. Joseph A. Cahoon, filed a patent infringement lawsuit on July 7th and obtained a restraining order against C.A. Smith, who was operating a similar ride on the Vanderveer property since June 1st. Wood and Cahoon had faced a similar situation in Memphis with Smith's infringement of his patent and prevailed in the Tensessee courts. They sat before Judge Benedict on Saturday July 5, 1884. Wood argued that their patented circular railway with the proper "descents," "waves," and "hills." was constructed on scientfic principles, and can't be appreciated by those in operation on the Island so far this season. Beside, the defendants have been using his patent since June 1st without compensating them. Judge Benedict, after hearing aruments on both sides, granted the injunction. Wood and Cahoon's double track circular rilway constructed near the New Iron Pier began operation on Tuesday July 22nd. When cars on both tracks were operating simultanously, the riders appeared to be running a race. It added to the excitement for those that watched fom the viewing platform in the center. The New York Sun reported on August 17, 1884 that there were five scenic railways at the resort. Two of them were circular, and one barker claimed that his was the longest roller coaster on the island. Of course La Marcus Thompson was furious with those who copied his ride, but he was powerless to prevent it until the patent he filed on April 3, 1884 was granted on January 20, 1885. The next patented inventor to arrive at Coney Island according to William Mangels in 1952 book, "The Amusement Park Industry", was Charles Alcoke, a Hamilton Ohio inventor. Since his name doesn't appear in the newspapers, we will take Mangels word for it since he worked at Coney Island beginning in 1889 or 1890. Alcoke was awarded US #317,273 for his Serpentine Railway on January 1885 on a patent filed on August 14, 1884. Cars with half a dozen passengers seated sideways followed an oval-shaped path as they traveled downward. The ends of the track met at right angles, but were joined by a turntable or piece of track with a very sharp curvature. As usual passengers climbed a stairway to its highest point, and the car was pushed or winched up the hill by several strong men. Charles D. Kramer, who was coincidentally from Hamilton, Ohio filed for a patent on January 29, 1885 and was granted patent US #315,640 for his Incline Railway on April 14, 1885. It too was a circular railway whose cars seated passengers sideways, but Kramer had a clever method of raising the cars back to the top. They rested on a platform attached to ten-foot-long pivot arms, that when moved in an arc, raised it up to the highest level. But it was 1885 arrival of Philip Hinkle from San Francisco the following summer that drove Thompson and his outdated invention towards bankruptcy and obsolescence. Hinkle, who was in the elevator business saw a small circular scenic railway using a primitive winch and pulley system on the lift hill in the San Francisco area, and sought to improve upon the design. The San Francisco Daily Bulletin reported on November 11, 1884 that the city granted a five-year franchise to O.S. Moore and H.H. Reynolds to construct their 200-foot-diameter, 25-foot-high "Roller Coaster and Circular Gravity Railroad" at the corner of Eight and Mission Streets. Each of its cars held 10-12 passengers. It must have been popular for others to follow since the newspaper reported George Dawson sued Philip Hinkle and Jane Doc Kendall on January 14, 1885 to dissolve their partnership of a "gravity pleasure road." Since Hinkle had been awarded a patent, the ride he had erected had a powered lift hill. Hinkle's patented steam-driven hoist, that pulled cars loaded with passenger to the top of a 20% grade lift hill, was a great advance in roller coaster design. Cars were drawn up by an endless cable wrapped around large revolving pulleys at each end. Fasteners at various points along the moving cable gripped the bottom of the car and pulled it along. It was quite similar to today's lift hill mechanisms, but without the anti-rollback safety device. He was awarded patent US #307,942 on November 11, 1884, and had filed on August 12, 1884. The higher hill meant faster speeds with a longer ride, and it was the first to offer forward facing passengers thrills with mild undulations instead of a tour of the countryside. Hinkle, by placing his seating crosswise, not only permitted couples to pair off, but increased the riders' sensation by allowing them to look in the direction of the coaster's movement. His scenic railway made two circuits around its nearly circular course with a crossover through a short tunnel. His patent also included a revolving grandstand in the center that allowed spectators to view the cars travelling the double circuit without craning their necks. There is no evidence that this feature was incorporated in the coaster built at Coney Island. Perhaps Hinkle thought that there would be more spectators than riders, but that wasn't the case. 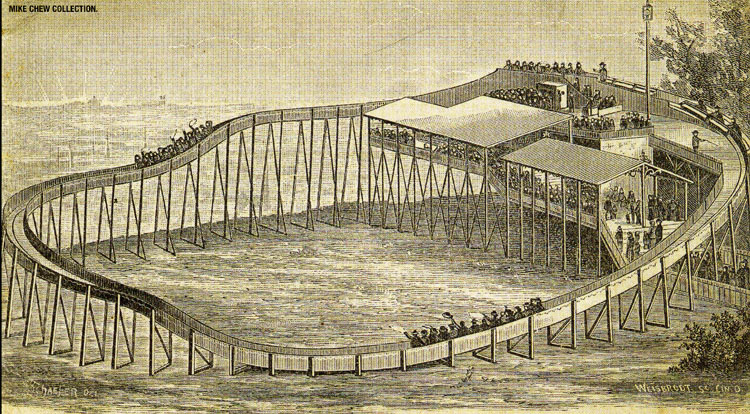 The competition at Coney Island in 1884 and 1885 gave La Marcus Thompson insight to the full potential of the roller coaster. During the next few years he made modest improvements and was granted thirty patents. Instead of speed and thrills, he staunchly defended sightseeing as an important feature of his roller coasters. In 1886 he began developing the concept of a true Scenic Railway in collaboration with Philadelphia inventor James A Griffith, the man who built the first roller coaster with a compact figure eight layout. Thompson's revolutionary ride, which would debut in 1887 at Atlantic City, New Jersey instead of Coney Island, would incorporate a steam-powered lift hill, a continuous track, an articulated train of cars, and elaborate scenery surrounding his tracks. Instead of using cheap painted cardboard landscapes, he created beautiful blue grottos decorated with blinking lights. The trains at strategic points tripped switches and floodlights that illuminated Biblical scenes and tableaus. Thompson's innovations combined with his marketing skill brought him many contracts to build his scenic railways at other resorts. By the end of 1888 he had built 20 in the United States and an additional 24 in Europe. Thompson, unlike his fellow roller coaster inventors, retained ownership of the rides he built, at least in the United States, and had the financial incentive for further patented innovations. He was successful, not because he necessarily had a better roller coaster, but because he was better capitalized and made scenic railway design his second career. John Taylor, Alason Wood, Charles Alcoke, Philo Stevens, Joseph Yearick, and Philip Hinkle were all instrumental in spreading the roller coaster riding fad of 1884-1886 throughout the United States. But each based their success on a single patented roller coaster design, and some like Wood, Alcoke, and Hinkle, cashed out by licensing their designs. Others like Stevens and Yearick after building a coaster in a city or resort, sold them at a profit to local businessmen to operate. Wood invested his profits unsucessfully in the real estate market, while Hinkle went back to his elevator business. Perhaps it was too early for these inventors to have made roller coaster design a career.